Add to a gift, drape on a Christmas tree, dorm desk, college bookshelves and more! Two of your favorite parts of the holiday season are probably gift giving and dorm room decorating. They're both plenty of fun and they both add a lot of dorm items to your college dorm checklist. When you give gifts to your friends and family, you want to make sure they aren't just placed in a plastic bag. You want to wrap the gifts to show you care and then you want to add some pretty accents to the gift wrap for extra style. When you give a gift to mom and dad, add our Gold Glitter Ribbon tied in a bow to the outside of the package. Our Gold Glitter Ribbon is a color that will go with any gift wrap color and any dorm room decor color theme. This dorm essentials item is thick and sturdy, allowing it to have multiple uses throughout your college dorm room decor while also being able to be used as gift ribbon. This dorm necessities item can be used to decorate your college dorm room door or you can wrap it around your college Christmas tree in addition to your garland and ornaments for extra dorm room decorations in your holiday dorm room decor theme. 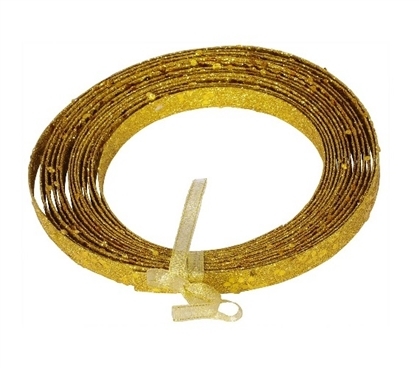 Some of the best dorm necessities are versatile dorm items like our Gold Glitter Ribbon. This dorm essentials item is so versatile you can use it for both gift wrapping and dorm room decorating!